Are one of the lines longer, shorter or the same length as the other one? Traditional psychology holds that perception is flawed, we see illusions because the underlying perceptual aspects of our experience need to be embellished, corrected, interpreted, etc, by our brain. While doing this we make mistakes. It is often posited as one of the major issues for ecological psychology to explain because it seems to invite cognition. After all, if all the information is detectable out in the environment, then why would we perceive the top line as shorter and the bottom one as longer? Perceptual illusions in real life (not on paper or a screen) can quite easily be dealt with. We could argue that the we have not sampled enough of the available information in the ambient optic array, so we do that by locomotion and change of viewing angle. When we do, very many illusions are simply dispelled (Kennedy & Portal, 1990, or Michaels & Corello, 1981). In fact Michaels and Corello explains this very well; if we are in a desert, looking for water and see a mirage (which may or may not be water), it is right of us to investigate if it is or not, not doing so would be the wrong action to take. In the same way, they exemplify, could we be fooled by a hologram until we reach out to try and touch it. Besides this point, the illusions that aren’t able to be dispelled by simply exploring, are always images or videos on a screen or paper. Making them in part unexplorable. As for the Müller-Lyer illusion, it is at the same time simple but abstract forms. All the information given is what is there, but even looking at it now, knowing they are the same length, I still perceive them as different lengths. A solution that has been suggested elsewhere (lost the reference sorry) is that the top figure shows an enclosing space, if we were to reach our hand in, we would be more constrained than the bottom figure. The information is specifying a smaller versus a larger space. Another assumption of traditional psychology is that (visual) perception works with the simplest aspects, lines, points, and that then there is a constructive process cognitively that puts things together into more and more complex constructions of what we perceive (into the full 3d-experience of the world). For a traditionalist then, there is no doubt it is an illusion, the lines are the same length, we perceive them to be different -our brain is playing tricks with us. From an ecological standpoint, it is impossible not to see the four end lines, you can’t not perceive them when perceiving the end of the lines. Therefore, they matter. It is fully possible that we actually don’t perceive the “simplest” form and construct it, in fact, this is what ecological psychology says we don’t do. The example comes from the Planimeter (Runeson). A mechanical, simple, device that can measure the area of irregular patches without knowing length, width or doing any computations. (For its full explanation, see here.) It thus measures a “higher order” thing, sqaure cm (or inch) without the “simpler” concepts. It is fully possible to conceive of the idea that we then simply cannot ignore the four end lines -they are not individual lines, they are a form that is important, in it’s whole, to our perception of it. 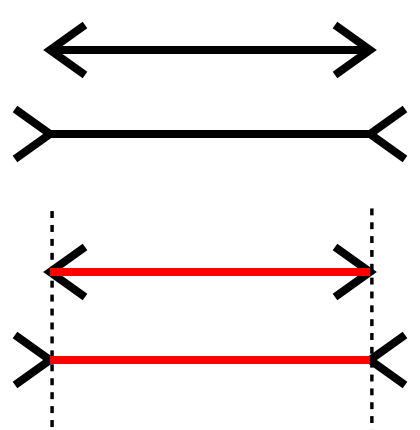 For this reason, it may just be so that the question “Are one of the lines shorter, longer or the same length as the other?” a silly question to ask. Because our perceptual system does not work on simple structure and construction, it is forcing us to do something that we simply don’t do, and therefore do it poorly. Previous Previous post: Is it an impossibility to “see” the Big Bang?